(Bloomberg Opinion) -- When one conglomerate has its eye on another, discounts go out the window. South Korea's chaebols are betting big on Vietnam’s sprawling corporations. They’re even willing to forgo the markdown that typically comes with them. Samsung Electronics Co. is now the largest employer in the Southeast Asian nation. Since joining the World Trade Organization in 2007, a third of the country’s foreign direct investment has come from South Korea. Retail money is also chipping in. Last year, Koreans were the second largest foreign buyers of Ho Chi Minh City’s luxury condos, and they’ve rushed into Vietnam-focused stock funds, despite shunning other emerging markets. Seoul’s presence is felt everywhere. In March, South Korea’s SK Group announced plans to invest $1 billion in Vingroup JSC. This would be the company’s second large bet on a Vietnamese conglomerate: Last September, it bought a 9.5 percent stake in Masan Group Corp., a smaller peer, for $470 million. The math, though, is very wrong. At a minimum price of 100,00 dong ($4.31) a share, SK is valuing Vingroup at 43 times 2019 consensus earnings. If the South Korean company is interested in Vingroup’s real estate portfolio, it could just buy into residential developer Vinhomes JSC at 18.3 times earnings. The Vingroup subsidiary accounts for two-thirds of its parent’s revenue, anyhow. Or if SK fancies Vingroup’s retail mall operations, the Vincom Retail JSC unit is up for grabs at 26.2 times earnings. Of course, it’s up to SK Group to decide how much it wants to pay. But inadvertently, the Koreans are exacerbating an unhealthy trend in Vietnam’s stock market: The so-called Vin Family – Vingroup, Vinhomes and Vincom Retail – now accounts for almost a quarter of the benchmark index, up from 8 percent two years ago. That’s not unlike Samsung Group’s influence on South Korea’s Kospi Index. With Vingroup returning 20 percent this year – bolstered by SK’s $1 billion placement – active funds now have an unenviable choice: Hold your nose and buy a holding company at a sky-high valuation, or explain to your investors why you’re not beating the ETFs. Foreign portfolio inflow is already muted compared with last year. Increasingly, Vietnam’s equity market is starting to resemble Seoul’s – you don’t know who’s who in the labyrinth of cross-holdings. Vietnam Investment Group JSC is the largest shareholder of blue-chip Vingroup, followed by founder and chairman Pham Nhat Vuong’s 27.5 percent stake. Who owns the investment group, though? We have scant information since it’s privately held. All we know is that Vingroup’s chairman “owns more than 10 percent charter capital,” according to a 2016 company filing. 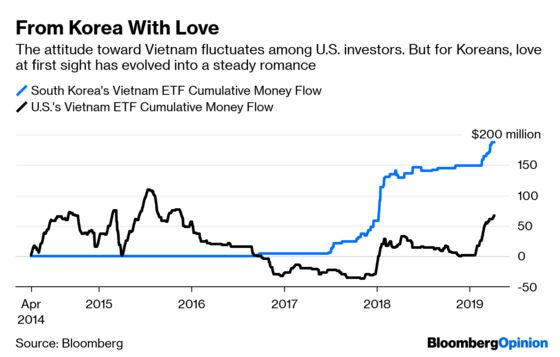 Vietnam Investment Group is by no means a passive investor, either. In 2016, Vingroup paid the firm more than $17 million for a land transfer agreement, and various office-rental and infrastructure-usage fees last year. The influence of this opaque shareholder on Vingroup's business operations remains a big question mark. 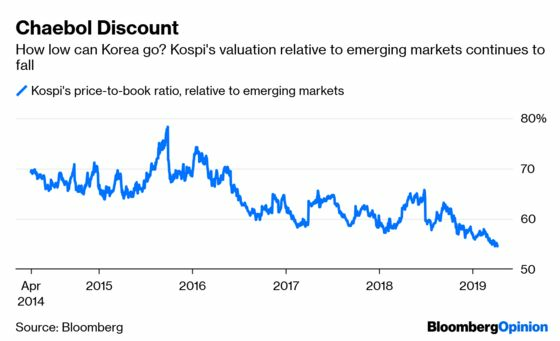 Perhaps this isn't a big deal for South Korea’s retail investors, who had to disentangle close to 100,00 circular chaebol holdings as recently as 2013. But for everyone else, this is a red flag. 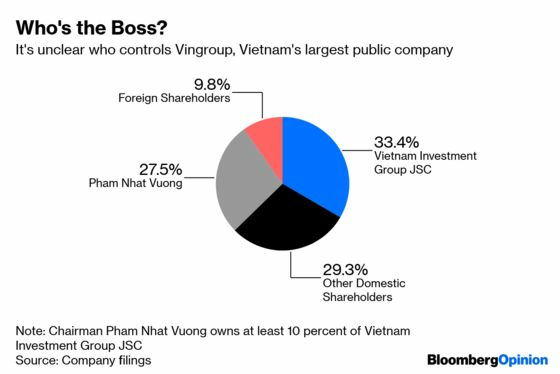 A document sent to Bloomberg Opinion by Vingroup clarifies that Vietnam Investment Group JSC is a family investment holding company, and shows that Vingroup's chairman had a 92.88 percent stake as of the end of 2017. To help foreigners better understand the company, though, disclosure could be better. Clarifying Pham’s holdings – direct and indirect – in Vingroup’s annual report would be a good place to start. When stock investors consider buying into a conglomerate, the first question they ask is whether minority interests are aligned with that of the majority – and to do that, they must know who the owners are. So far, Vietnam is returning the love, and reveres South Korea’s manufacturing prowess. But if Hanoi allows its stock market to fester like Seoul's, Vietnam will soon catch that notorious Korean discount, too. In response to Bloomberg Opinion's query on why Vingroup would not disclose its chairman's stake in Vietnam Investment Group JSC, a spokesperson said, " ... in determining related party connections, >10% or > 50% ownership does not make a difference and we have always disclosed that Vietnam Investment Group JSC is a related party to Mr. Vuong."